Diabetes have been described as the ‘epidemic disease of civilization‘. Type-2 diabetes, which accounts to as much as 90% of all cases are increasing rapidly over the last decade. With the rise of modern technologies, life in general is considered to have improved substantially. 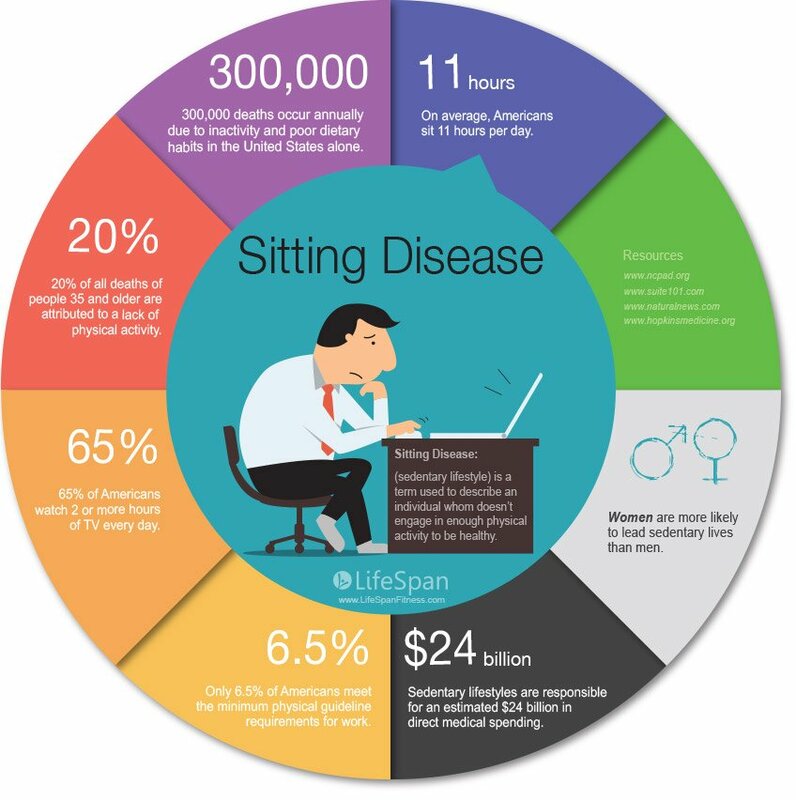 Ironically, technologies that are involved in the production of foods, gadgets that are aiding in worldwide communication and work productivity, and the advances in the modes of transportation have lead to the modern urban lifestyle of the “Rich, Fat, and Sitting Down“. Technologies such as those involved in food production, farming and food processing, allow people to ingest more calorically-dense food than ever before in far greater amounts. We are talking about food stuffs that didn’t even exist until recently. In contrast, it is actually hard to overeat traditional staple foods such as rice. Then there are transportation technologies, which enable people to avoid walking, and also the shift from manual labor to machines. These technologies have shifted the amount of energy that people expend in doing their daily business. In conclusion, technology has given us this surfeit of calories and dearth of energy expenditure. 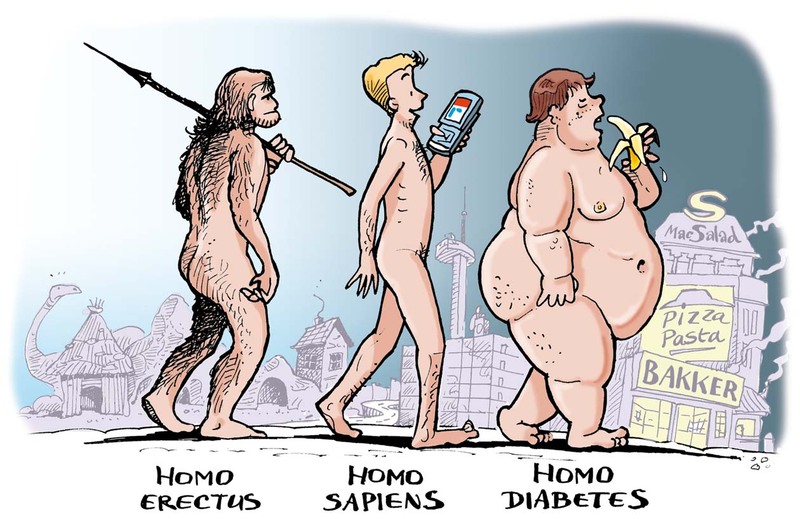 I am not suggesting that we should be Luddites and go back to subsistence farming and walking everywhere, but we have to deal with the consequences of pushing our metabolism beyond what it is capable of handling. 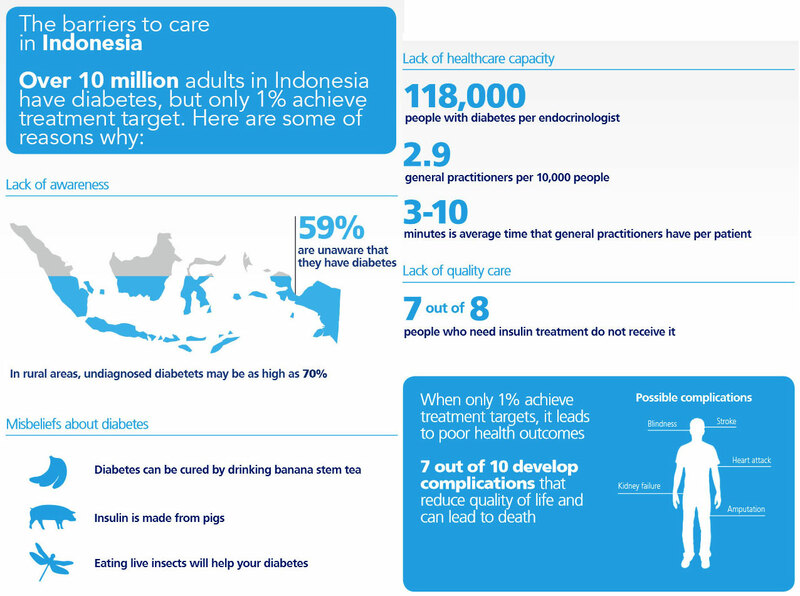 Indonesia is currently holding the proud position as the seventh country in the world with the most diabetic population. In a country of 255 total population, 161,572,000 adults of the age 20 – 79 years are at increasing risk of obesity and diabetes. Adult obesity – although are starting to be realised by Indonesian people as a risk factor for heart diseases and diabetes – is more likely to be a result of unresolved childhood obesity. While people in developed countries are already fighting with the problem of childhood obesity epidemic, most Indonesian parents – even those with high education – are still unaware of this problem. Parents are more worried about raising a malnourished child than they do about the threat at the other end of the scale. 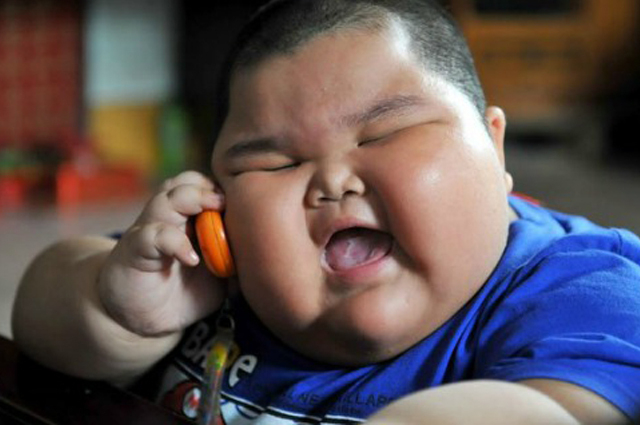 The desirable child standards in Indonesia has light skin (from not being out in the sun; which is another risk for Diabetes) and chubby cheeks. Parents are proud of them being plump, associating fat children with wealth and a better family standard of living. Currently, the prevalence of Diabetes in Indonesian adults are at 6.2% with a total case of adults with diabetes of over 10 million. This high number of diabetics, ultimately leads to a high number of deaths (184,985 deaths in 2015) caused by diabetes and its complications. As low as 1% of diabetic patients are getting adequate treatment. This challenge may partially be attributed to the lack of public awareness towards the symptoms and signs of diabetes, purpose and targets of treatments, and risks of complications associated with diabetes. So you regularly see your provider for diabetes care, and that is a great place to start! However, people with diabetes are at much greater risks for infections and diabetes-associated complications. Diabetes, even if well managed, can make it harder for your immune system to fight infections. 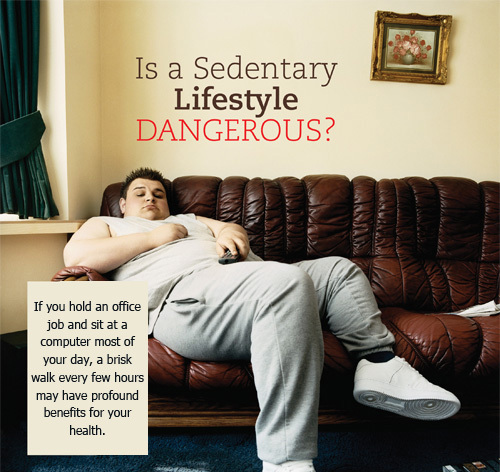 Therefore, you may be at risk for more serious complications from an illness compared to people without diabetes. Some illnesses, like influenza, can raise your blood glucose to dangerously high levels. 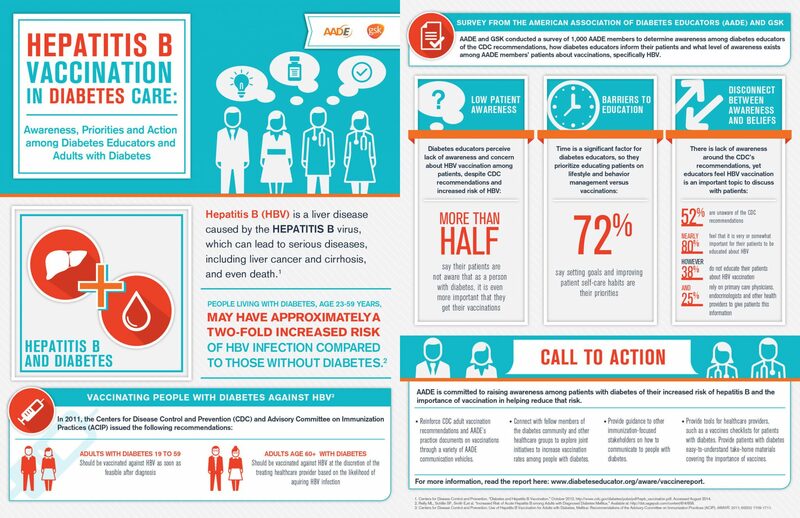 Diabetics have higher rates of hepatitis B than the rest of the population. Outbreaks of hepatitis B associated with blood glucose monitoring procedures have happened among diabetic people. People with diabetes are at increased risk for death from pneumonia (lung infection), bacteremia (blood infection) and meningitis (infection of the lining of the brain and spinal cord). 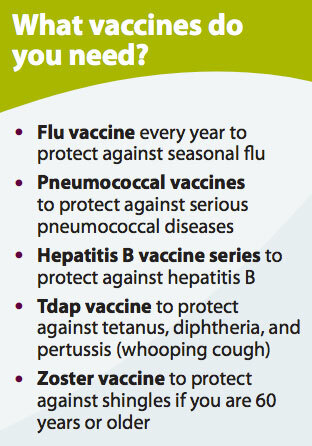 Immunization provides the best protection against vaccine-preventable diseases.